Cooling capacity 13 - 430 kW. 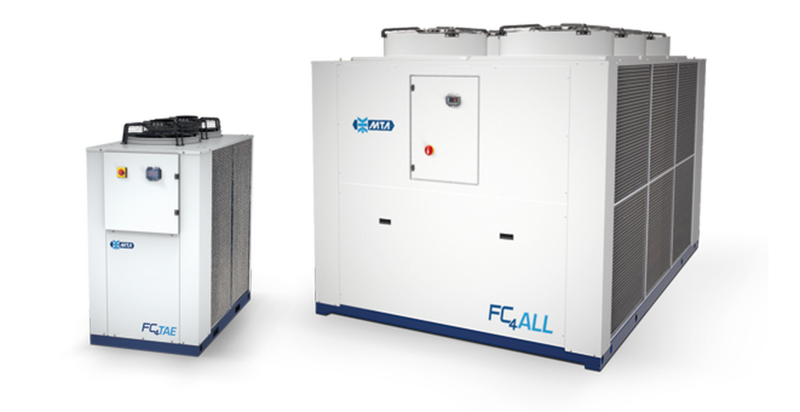 FC4TAE and FC4ALL are the most energy efficient and flexible free-cooling units on the market, offering a fully packaged solution, which can be used as a stand-alone free-cooler or added to a chiller also in a second time. The range of FC4TAE and FC4ALL series liquid coolers consists of 7 packaged models equipped with finned water coils, axial fans, free-cooling, water valve and a microprocessor controller. The “modular concept” employed to design this range enables FC4TAE and FC4ALL units hydraulic integration with any liquid chiller in the TAEevoTech and Aries Tech. The use of free-cooling mode provides impressive energy savings and is particularly suitable for industrial processes where the production of chilled water is required all through the year. Under this system, the low temperature of the outdoor air is used in winter, autumn and spring to completely or partially cool the process fluid normally cooled by the chiller with the aid of its refrigeration compressors. During modular free-cooling operation, the FC4TAE and FC4ALL modules are controlled and managed by the on board microprocessor, cooling the process fluid “free of charge”, with the compressors either shut down (total free-cooling) or in partial operation (partial free-cooling). FC4ALL modules, if combined with a chiller ARIES Tech fitted with X Drive electronic control, is able to work in a modular way (master and slave).